Sometimes there's a thin line between cheering and hate. I was reminded of this last Saturday night, when I watched what passed for the Michigan-Alabama game with some Michigan State fans who claimed they were rooting for the Wolverines. You know—Big Ten pride and all. But if they were, they weren't putting much into it. As one of the Spartans explained to me: "If they get creamed, I won't cry about it." Michigan got creamed. My friend didn't cry about it. In fact, I'm pretty sure I saw him smiling a little bit. Then he celebrated by drinking about six more beers—one for each Alabama touchdown—and arguing that our country went down the tubes when U.S. senators started being chosen by popular vote instead of state legislatures. We don't cheer for the same sides in politics or in football. Incidentally, the new way of electing senators was put into effect in 1913. Still, that year wasn't a total loss for my friend. On October 18 the Michigan Wolverines suffered a 12-7 home-field defeat at the hands of the Michigan Agricultural College Aggies—who later became the Michigan State Spartans. The U.S. Constitution may be amended from time to time, but Michigan State fans never really cheer for Michigan. I saw MSU people posting "Roll Tide" on Facebook before, during, and after the Alabama massacre. I get it. All serious fans have somebody they loathe so much it amounts to a kind of love—a team whose losses they relish almost as much as wins by their guys. Hate is a strong word, so I'll put it this way: I really, really, really can't stand Notre Dame. I know lots of good (if obviously flawed) people who somehow became Notre Dame fans. I'm strangely fond of South Bend, Indiana, after growing up in another rust belt town a half hour away. I don't even mind seeing the Irish men's and women's basketball teams winning a few games once fall turns to winter. But in the realm of college football, they're the St. Louis Cardinals, Dallas Cowboys, and New York Knicks—times 77. Sometimes they're really good; most of the time they're really good at thinking they're really good; and in nearly every instance my teams are lousy and it pisses me off. In short, I've got my reasons, most of which make as much sense as the notion of hoping Northwestern will win football games each week. And this: I enjoy being part of a wider community, a not-so-silent majority, who can't stand Notre Dame football. When the games go badly for the Fighting Irish, we get to enjoy life together. Which brings me to the matter at hand: In one of the saner-looking weeks on the football schedule—no ranked teams play each other—Notre Dame hosts an improved Purdue squad in South Bend. 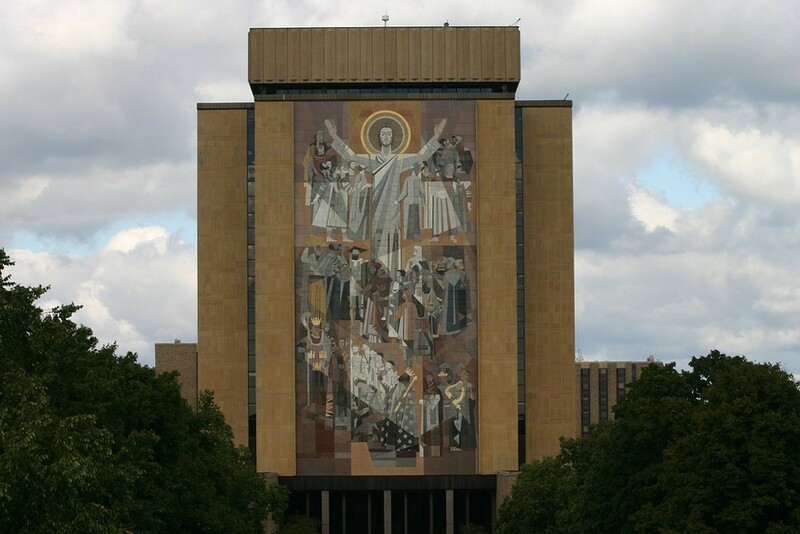 Here's hoping Touchdown Jesus signals lots of scores by the Boilers. And on to the games. Cincy over Pitt: Cincy wasn't the Big East team that got walloped by Youngstown State last week. Obama over Cincy: I love college football on Thursday nights, but this week the Bearcats and Panthers will lose out to the president's speech at the Democratic convention. Ohio State over Central Florida: The Buckeyes win the battle of the bowl-banned. Virginia over Penn State: A week after falling to Ohio, the Nittany Lions lose to another swing-state school. Minnesota over New Hampshire: Why is this game on the schedule? And why am I writing about it? Life is strange. Indiana slips past UMass: Well, it is lovely in New England this time of year. Michigan State over Central Michigan: Just give the ball to Le'Veon Bell another 44 times. Michigan over Air Force: Denard Robinson completed 11 of 26 passes against Alabama. That's 11 more than it seemed like. Still, Air Force isn't Alabama. Purdue over Notre Dame: Good god, please. Iowa over Iowa State: The Cyclones have won eight of the last 15 but haven't taken one in Iowa City in a decade. Wisconsin over Oregon State: It will be a few more weeks before the Badgers suffer the first of their inevitable disappointing losses. Nebraska over UCLA: I could be wrong about this one. Of course, I could be wrong about all of them. What is truth? Arizona State over Illinios: Sorry, Illini fans. Actually, I'm not that sorry—I'm a Northwestern fan. A banged-up Nathan Scheelhaase means Illinois will be without one of its few offensive weapons. Northwestern over Vanderbilt: Against Syracuse the Cats tried an experiment to see how many times they could commit pass interference and still pull a win out of their asses. The answer was four. Aaron Rodgers's little brother Jordan may throw for 600 yards, but here's hoping NU gets the ball last. Mizzou over Georgia: The Bulldogs are ranked seventh nationally for a reason. But I really like the idea of the Tigers pulling an upset win at home in their first game in the SEC. Last week: I went 13-1, though picking Michigan should probably count as two against me.